Birds and bats are the two types of animals with true wings -- as opposed to those with flaps of skin that allow them to glide. All bats have evolved to fly, but many species of birds have not. Plenty of species of ducks, geese, swans, cranes, ibises, parrots, falcons, auks, rheas, rails, grebes, cormorants and songbirds are flightless. Some, like the dodo, have gone extinct. Many others thrive, especially those who are powerful runners or skilled swimmers. The ostrich, indigenous to African deserts and savannas, is the world's biggest bird, and it can't fly at all. 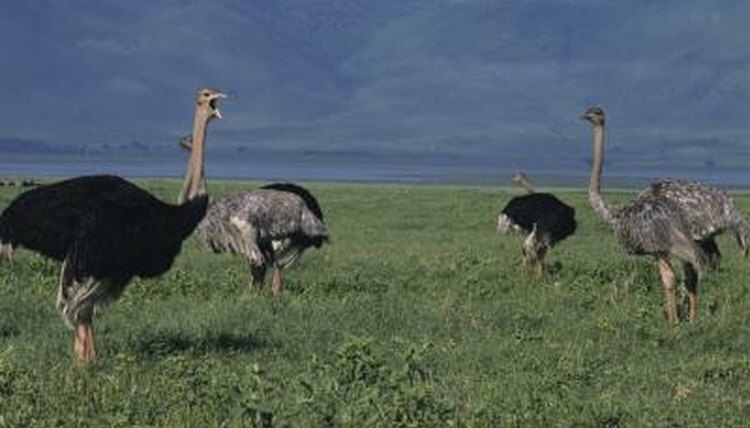 The ostrich is a formidable runner, though, in terms of both speed and stamina. The bird can sprint up to 43 miles per hour and run long distance at speeds of up to 31 miles per hour. Ostriches use their wings sort of like rudders to help them steer while running, and their long legs can stride up to 16 feet in a single bound. Their powerful legs with their formidable two-clawed feet are potentially fatal weapons, too. It's a misconception that ostriches bury their heads in the sand; they simply bend down and lay their heads flat against the ground to escape detection by predators. Like ostriches, emus are part of the ratite group of flightless birds. Emus are the second-largest birds on Earth, and they too are winged but land-bound. These flightless birds also feature powerful legs and can run at speeds up to 30 miles per hour. They take individual strides of up to 9 feet. Their feathers look more like shaggy fur, and their wings are only about 7 inches long. Emus are indigenous to Australia, where they are protected but largely viewed as pests because of their propensity for descending on farm crops in large numbers and feasting. Penguins are undoubtedly the most famous flightless birds outside the ratite family. Seventeen species exist around the globe, most of which look fairly similar except for some variation in size and head and neck markings. The little blue penguin is the smallest species, reaching only 1 foot tall; the emperor penguin is the largest, topping off at a little over 3 feet tall. Penguins waddle clumsily on land but they're adept swimmers, using their wings as flippers and their feet as rudders. Many live near the poles and in subarctic regions, while others make their homes around Australia and New Zealand. Kiwis, of which there are five species, are another fairly well-known flightless bird. The only natural populations on the planet are found in New Zealand, an island country that's home to a disproportionate number of flightless birds. The kiwi is the national symbol of New Zealand. These birds feature long beaks for getting at the bugs they eat and tiny wings that can't be used for flight. They're also known for their distinct smell, often compared to that of mushrooms, and their relatively large eggs that can monopolize up to 20 percent of a laying mother's body. What Are Some Differences Between a Bird & a Bat?